“We consider the two towers of Notre Dame to have been saved,” the Paris fire-service commander Jean-Claude Galler said at around 11pm, as firefighters were still working to contain flames. The fire service said the fire had been reduced and it was a major accomplishment by hundreds of firefighters that the flames were stopped from spreading to the north tower belfry. However, the roof “had been ravaged”, with around two thirds destroyed. Smoke billowed into the sky, visible from across the city, and ash fell in the surrounding area. Paris’s deputy mayor, Emmanuel Grégoire, said emergency services were trying to salvage artwork and other priceless items stored there. 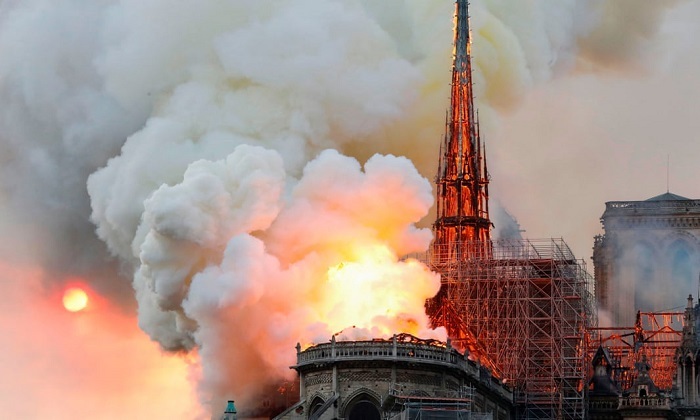 “There are a lot of artworks inside ... it’s a real tragedy,” the city’s mayor, Anne Hidalgo, told reporters at the scene.